Window Rock, AZ — On August 14, 2015 dozens of Diné (Navajo) took action to resist U.S. Senator John McCain’s attempts to steal precious water and desecrate sacred lands. McCain had private meetings scheduled at the Navajo Nation capitol with Diné and state politicians which included discussion of the controversial Navajo-Hopi Little Colorado River water rights settlement. At one point state and Tribal police blocked demonstrators from leaving the museum building. 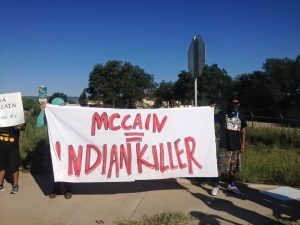 An elder intervened opening the door allowing the group to pursue after McCain’s convoy yelling, “Get off our land!” Police blocked access to the airport where McCain quickly departed. 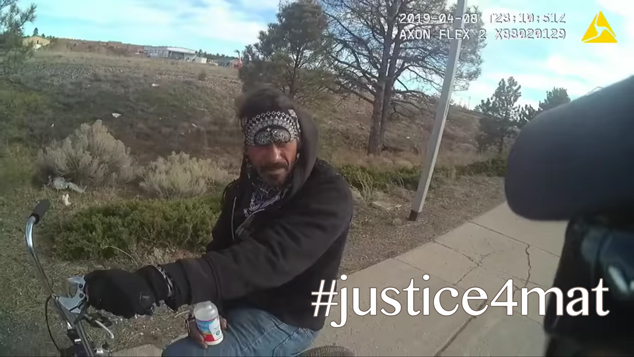 Despite heavy law enforcement presence, no arrests were made. McCain has long established himself as an enemy of Indigenous lifeways. From furthering forced relocation on Black Mesa for coal mining (S.1003), political support for ski area desecration of the Holy San Francisco Peaks, to his most recent attack against San Carlos Apache Holy lands at Oak Flat for copper mining, McCain has long placed corporate interests over Diné and other Indigenous Nation’s survival. In the face of ecological and climate crises, McCain and a handful of Navajo political collaborators continue to further extreme pollution from fracking, coal mining, and Coal-Fired power plants operating on the Navajo Nation. 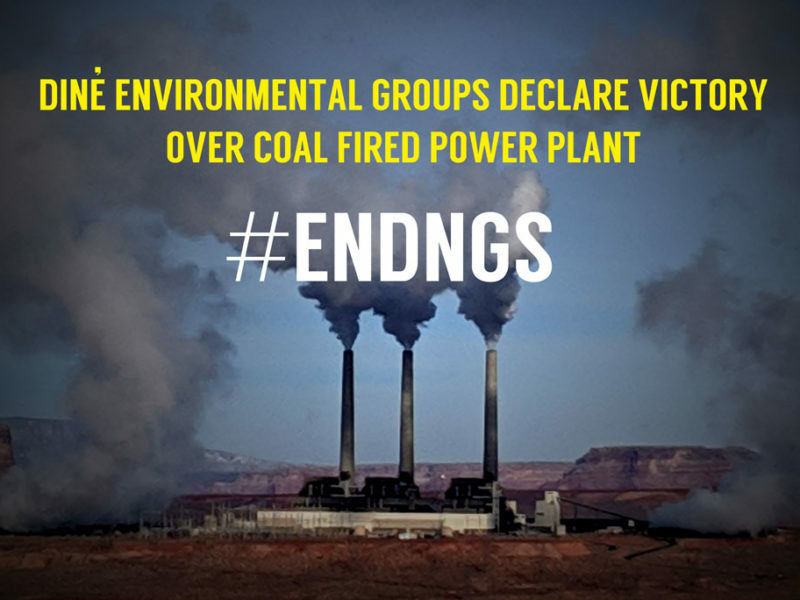 These actions appears to contradict other ecologically responsible measures such as the Diné Natural Resources Protection Act of 2005, which banned uranium mining and processing on Navajo lands, the 5 Year plan to clean up abandoned uranium mines, and the recently declared a state of emergency due to the Gold King mine disaster which threatens sacred and vital water ways such as the San Juan and Colorado. 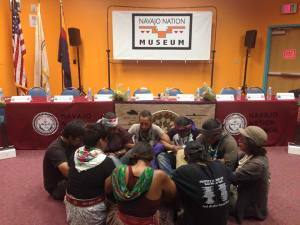 Window Rock, Arizona- Friday August 14th, 2015 a group of intergenerational Diné Citizens concerned about the intention of John McCain’s visit to the Navajo Nation staged a peaceful protest. 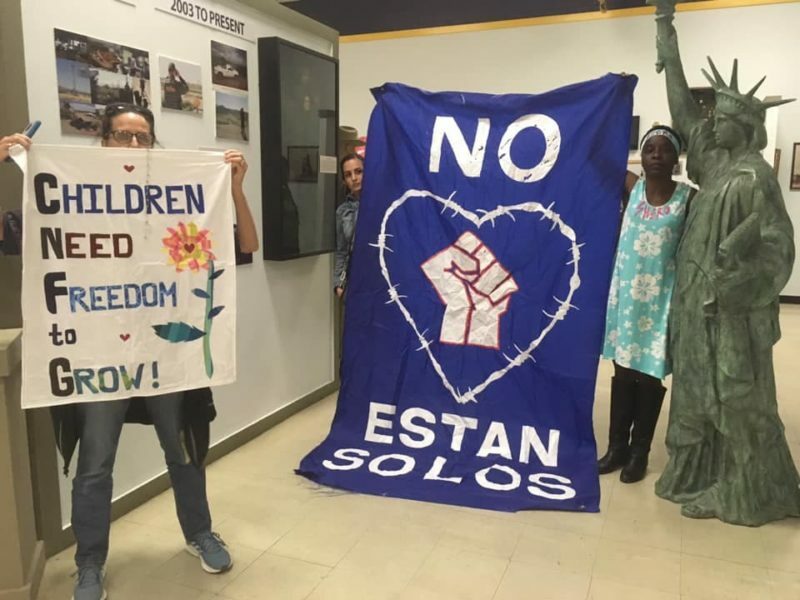 Utilizing the power of song and prayer, a small group staged a sit-in in the room where the congregation was supposed to take place. A second group took position outside of the museum to greet elected Navajo officials, requesting them to stand strong as leaders. MaCain spent the majority his four hour Window Rock visit in the company of Speaker Lorenzo Bates and Senator Carlyle Begaye. Senator McCain and Senator Carlyle face ongoing criticism for their close affiliation with corporate entities, particularly in the area of energy and mineral development, which has predominately disadvantaged Native American tribes throughout the Southwest. Navajo citizen’s demands for protection of existing water claims are framed within larger assertions of sovereignty over land and resources and Speaker Lorenzo Bate’s actions are contrary to these goals. A primary message of today’s protest was the centrality of water for Diné existence—both physically and spiritually. The use of drum and prayer during the demonstration was especially effective in gathering public affirmation and support. It is evident that “business as usual” politics are no longer accepted and that greater accountability of all elected officials is demanded by those who understand the sacredness of Water. Water connects all life, connects all communities and connects all struggles. It took me all these years to figure this out (yes, I am DENSE!) but this is just the reason why the BIA belongs to the Department of the Interior–so any land disputes come under the purview of the “parent” agency. The BIA, which many times doesn’t work any harder on behalf of the Indians’ best interests than it has to, isn’t going to try to buck the bureaucracy of the higher-ups in the chain of command. So the Indians’ fate is decided before any controversy arises. IT’S WAY PAST TIME THIS SYSTEM CONTINUES LIKE THIS! THERE IS NO NEED FOR THE BIA EXCEPT TO HARASS INDIANS AND MAKE THEM LESS THAN AN EQUAL CITIZEN TO THOSE OF US WHO ARE NOT INDIAN!